Corona Regional Medical Center offers advanced medical treatment and a wealth of services for people age 55 and better, right here in Corona. Corona Regional is expanding its facilities and practicing advanced medical treatments to care for you. Most insurance and Medicare/Medicaid are accepted! Crown Plus Senior Program. Become a member and enjoy monthly lunch and learn topics presented by physicians and other experts. To find out more information and to join the program, please call 951-736-6296. Call 1-800-882-4362 for a free physician referral. We'll help find the right doctor for you. Stroke Telemedicine in our new Emergency Room. Neurologists use advanced technology to view, diagnose and treat emergency room patients presenting with possible stroke. Volunteer Programs. Make new friends and share your smiles and life experiences with patients and staff. 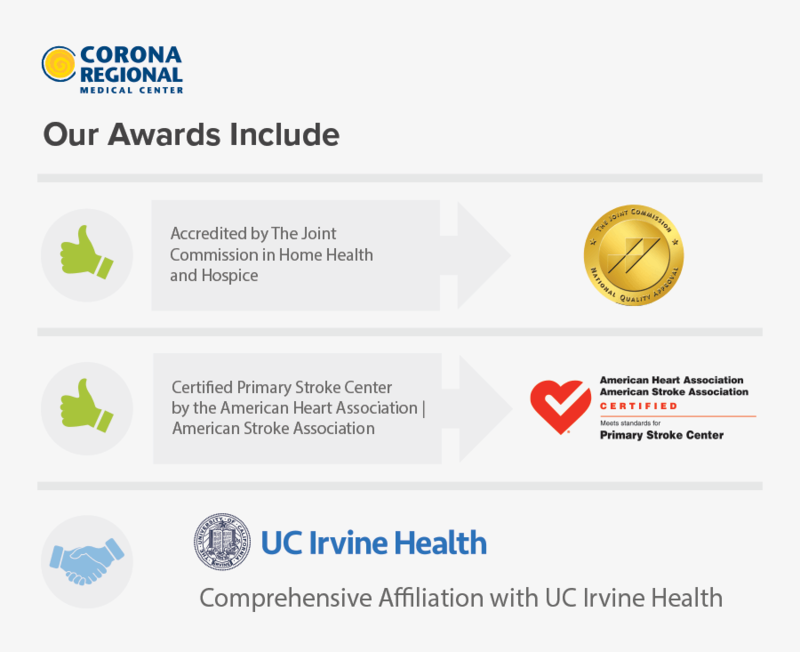 Corona Regional also offers expanded cardiology, advanced diagnostic imaging services, surgical services, orthopedic and total joint care, urology, diabetes care, rehabilitation, home health and more! We invite you to explore our website and see all we have to offer.